Le Triomphe de l’Amour. Photo: Pascal Gely. 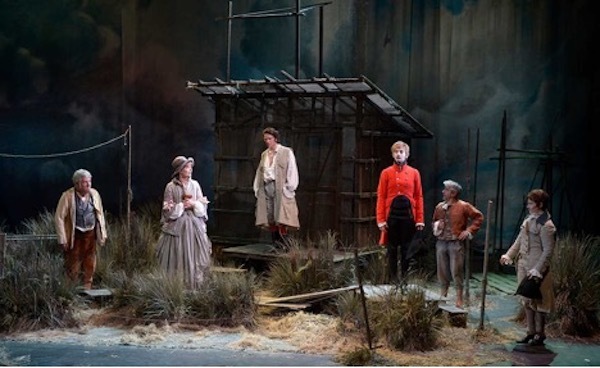 This revival of Marivaux’s seldom produced play, Le Triomphe de l’Amour, was mounted by a stellar team: Denis Podalydès (director) who is also a sociétaire of the Comédie Française (and winner of two Molières) and a frequent supporting actor in French films; Eric Ruf (set designer) also a man of many talents, former sociétaire and now chief administrator of the Comédie, and thus Podalydès’s boss, who designed the single set—a sad-looking hut in the woods against an elegant painted canvas backdrop; and the famous fashion designer Christian Lacroix (costume designer), who created the elegant period costumes. The musical interludes between the acts were arranged and played by the great baroque cellist Christophe Coin. These interludes were both a great treat and the most successful part of the production (although I could have done without “Le Plaisir d’Amour,” but this is undoubtedly because of the awful, widely played English version “I can’t help falling in love with you”). Le Triomphe de l’Amour is said to be one of Marivaux’s favorites among his own plays, an appreciation that is not widely shared. Quite apart from the play’s marivaudage, with its expected wit and sparkle, it fails to account for its main action: the sexual seductions by the cross-dressing female protagonist, Léonide, of the philosopher Hermocrate and his sister Léontine. The reason provided by Léonide—that she must enter Hermocrate’s secluded domain to contact his pupil, her cousin Agis, whom she loves and wishes to restore to his rightful place as King—does not explain why she needs to seduce the philosopher, much less his sister. And then of course Léonide seduces Agis, as well. When the three seductions take over and become the play, trickery, along with a certain silliness, predominates, and when Hermocrate and Léontine simultaneously discover that they are about to marry the same person—he a woman, she a man—we are in plain Feydeau—except, of course, that we aren’t. There is also a sub-plot mirroring the main plot, a bawdy love affair between Léontine’s squire, also a woman in disguise, with Dimas, a country bumpkin with a thick accent; along with a Harlequin, he is one of the two clowns. Like Shakespeare’s clowns, the domestics comment on their betters and they also go on for too long. The production as a whole, as the reviewers noted, drags, which is made worse by its run time of three hours without intermission. The ending of the play is both immensely puzzling and dramatically unsatisfying. When Léonide is unmasked, the comical even farcical action abruptly ends and seriousness takes over; naïve Agis suddenly becomes a man and acquires dignity, abandoning the well-meaning but deceitful Léonide to walk off stage to claim his kingdom. Love has decidedly not triumphed, as in the play’s title, but what are we to make of this heavy irony, and what are we to make of all the much ado? The melancholy tone of the musical interludes is not strong enough to counteract the brash comedy of the actual scenes. 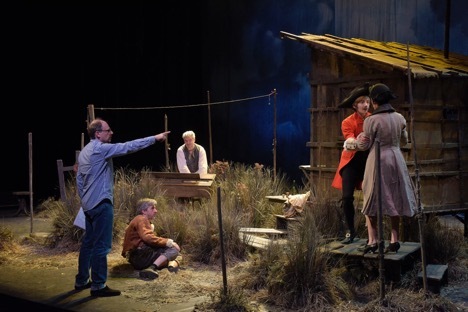 It is clear that director Podalydès decided to let the play take its odd course without attempting to bring an emphasis, much less a “reading,” to Marivaux’s text. For this, he received mixed, leading to bad reviews, with Fabienne Darge of Le Monde claiming that the production gave no evidence of a director’s hand and lacked freshness and imagination. This assumes, of course, that a director is expected to provide sense to a text that lacks it, and Darge might rather have asked why Podalydès chose to revive the play at all. On the other hand, mediocre Marivaux is still Marivaux, and anybody interested in his work, it seems to me, should be glad to see his weaker plays performed; one seldom, if ever, hears the complaint that Shakespeare’s Titus Andronicus is not worth reviving. It makes more sense to applaud Podalydès for reviving this odd, unsatisfactory piece by the sui generis Marivaux than to criticize him. The acting of the production made up for many of the longueurs and the bafflement. 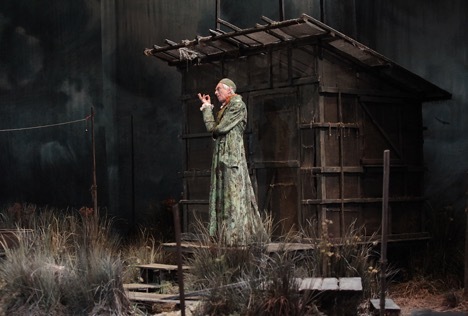 The veteran Philippe Duclos was magisterial as the vain philosopher Hermocrate, and Leslie Menu mostly managed to remain charming in the exhausting role of Léonide, who is on stage through most of the action. Stéphane Excoffier successfully camped the role of the long suffering Léontide. Of the principal actors, only Thibault Vinçon as Agis was ineffective, both mentally and physically too heavy for the romantic lead (and badly served by La Croix’s revealing blouse). The clowns were professionally rendered by the veteran actors Jean-Noël Brouté (the Harlequin) and Dominique Parent (the Dimas). One can’t write about a production at the Bouffes-du-Nord without commenting on the pleasure of experiencing the old 19th-century house, in one of the 500 seats, gazing at the huge, worn proscenium arch that Peter Brook, in his genius, left un-renovated. It’s a reminder of theatre, and the survival of theatre, through the ages. Joan Templeton is the author of 30 articles on Ibsen and other modern dramatists in PMLA, Modern Drama, PAJ, Theatre Journal, Scandinavian Studies, Ibsen Studies and elsewhere, and author of the books Ibsen’s Women (Cambridge 1997), Munch’s Ibsen (U of Copenhagen, 2008), and Shaw’s Ibsen (Palgrave, 2018). She has served as the President of the Ibsen Society of America and the International Ibsen Committee and edits Ibsen News and Comment. She was recently awarded the Royal Order of Merit, one of Norway’s highest honors, by King Harald.